Swift Cottage01263 715779work01603 870304fax Self-cateringSwift Cottage is a distinctive, grade 11 listed cottage in the heart of the attractive and bustling market town of Aylsham. Tucked away in the quiet conservation area of Millgate the cosy interior is attractively laid out. The ground floor has a sitting/dining room with comfortable seating and a well equipped separate kitchen, whilst the first floor has a double bedroom with a shower room next door. Outside the pretty garden offers a tranquil spot in which to relax. Aylsham has numerous facilities to hand and you are only ever a short stroll away from a variety of shops, restaurants, cafes and tea rooms and if you are an antiques buff, remember to check out the regular, local auctions. There are fine historic houses to visit in the area at Blickling, Felbrigg and Holkham, the popular Georgian town of Holt is less than half an hour away and there are many delights to discover along the north Norfolk coast, home to bird reserves, wide sandy beaches, quaint seaside villages, windmills and a colony of seals at Blakeney Point. Swift Cottage offers weekly bookings starting on Saturday. Swift Cottage is a distinctive, grade 11 listed cottage in the heart of the attractive and bustling market town of Aylsham. 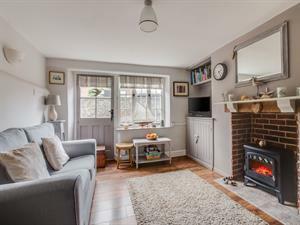 Tucked away in the quiet conservation area of Millgate the cosy interior is attractively laid out. The ground floor has a sitting/dining room with comfortable seating and a well equipped separate kitchen, whilst the first floor has a double bedroom with a shower room next door. Outside the pretty garden offers a tranquil spot in which to relax. Aylsham has numerous facilities to hand and you are only ever a short stroll away from a variety of shops, restaurants, cafes and tea rooms and if you are an antiques buff, remember to check out the regular, local auctions. There are fine historic houses to visit in the area at Blickling, Felbrigg and Holkham, the popular Georgian town of Holt is less than half an hour away and there are many delights to discover along the north Norfolk coast, home to bird reserves, wide sandy beaches, quaint seaside villages, windmills and a colony of seals at Blakeney Point.